June is definitely a month of memories its when 4 yrs back I met the man of my life and the month 2 yrs back I begot my baby blog ;-). With all good memories to ponder, I wanted to share the love with all of my wonderful readers, fellow bloggers and family announcing a giveaway. Like you know me I am never good at events or giveaways, I felt it would be a way of expressing my gratitude towards all of you, I am too small to treat all but I sure can make someone lucky by hosting and gifting you something special. This is purely to express my thankfulness and stir up a competitive spirit in all of you to work yourself for the giveaway. As you all know I am mad about baking and I wanted to share a gift that is close to my heart and my interest. 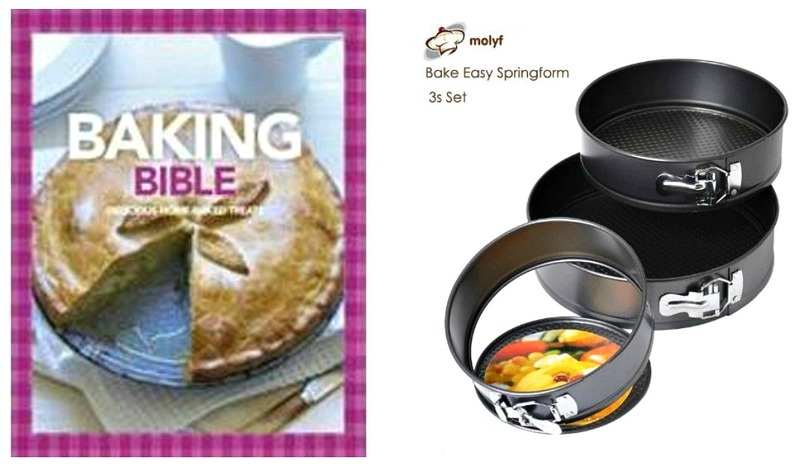 I will be giving away a book & 3 set baking pan to one lucky winner of this giveaway. Please read more details below and follow the instructions to guide you. 2. 3 tin springform non stick cake pans/ tins in sizes 18,20 & 22 cms. I will pick 2 lucky winners of this giveaway. 5. Cook any recipe (veg/ non-veg/baking) from my blog www.cooklikepriya.com & post a picture of the recipe you tried in your own facebook profile and tag COOK LIKE PRIYA FB Page. 6. Once you have followed all the above then post a comment in this blog post with your Name, FB profile name & email id. Note - I will get to decide the winner based on originality of recipe picture, likes for the post & number of entries. 2. Non Indian residents can participate if they want to share their price with their family in India. 3. Bloggers & non bloggers can participate. 1. The more number of likes. 3. Adding a testimonial/ feedback of the recipe you have tried. 4. Take a good picture of the recipe tried, do not steal pictures off the internet or post old recipe pictures. Kindly do not post my own recipe pictures. 1. You can choose to post the recipe on your blog or not. 2. In case you do post recipe on your blog please give credits to orginal recipe. 3. You have to share the recipe picture and tag my Facebook page Cook like Priya. This is mandatory. 4. Multiple number of entries are allowed. 1. Choose a recipe from my blog & click a picture of it. 2. Post in your facebook profile & tag my Cook like Priya facebook page with a feedback of the recipe. 3. Multiple number of entries are allowed. Happy Cooking & best wishes on winning the giveaway. In case you have any doubts please contact me cooklikepriya (at) gmail (dot) com. There is a special treat awaiting you all up next on my blog :-) stay tuned. Happy Blog anniversary sis, yes June is one of my favourite month as well and you know the reason too.. Giveaway looks wonderful,keep on rocking sis.. We love you and your space. Wonderful Priya. Congrats on your blog anniversary. Wow...thoughtful giveaway! Congrats again dear!! Priya edhu nadukudho illayo i need all the gifts.. Happie bloggiversary dear..
congrats in reaching a milestone! Happy baby blog anniversary! Wish u many more! a lovely giveaway! can we do blog post ? Congrats on the blog anniversary!! Clear and precise recipes. Have tried two different cakes and would do more. Very useful hints and tips in the cook's wisdom section. Good luck and all the best wishes! Hey Priya, Happy blog anniversary and thank you for hosting the event to celebrate.